SonyEricsson undergone an ordeal, when it had to form new phone line and support distribution of old models from Ericsson and Sony simultaneously. 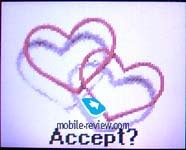 A joint enterprise meant not only a new name but also a new approach in phones creation. First changes appeared in design features, some attempts were successful, another ones failed, but the company tried to find something new. 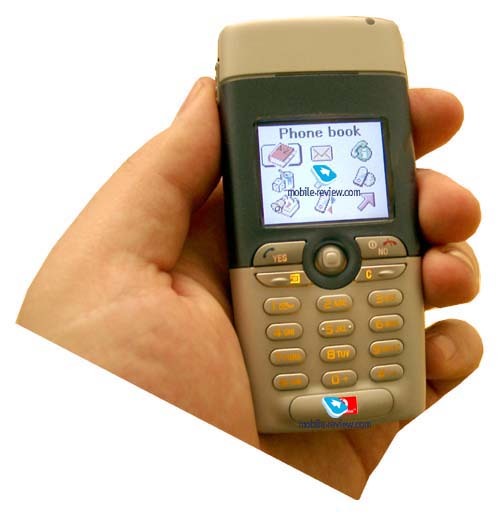 From 2003 onward the search is finished, the company made a new phone - SonyEricsson T310. In contrast to T300, T310 has an aggressive design. Though this middle-level phone has the same dimensions, it looks very unusual. We asked dozens of people, nobody expressed deep aversion to phone’s design. It’s interesting that when we, first, showed photos, there were more negative opinions about it. It can be easily explained. The way, in which engineers placed different color zones, is very important, besides, the phone has splay sides. The play of light and shadow on the exterior of the handset make it more pleasant for view. Unfortunately, the picture can’t reproduce the feelings. Now we don’t have information about available colors of the phone. As far as we know, there will be several kinds of display rim (brown, blue and gold). To all appearances interchangeable covers are presumed, as the phone is partly aimed towards young people. We don’t want to continue discussing design. We think that it is quite good for this class, on the one hand, it is made in youth style and on the other it has pastel colors. Taking into account that T310 is a revised T300, they have the same technological features. 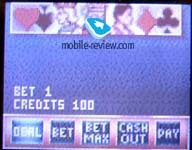 A graphic screen can display up to 256 colors and has a resolution of 101x80 pixels, what allows to show up to 8 text lines. 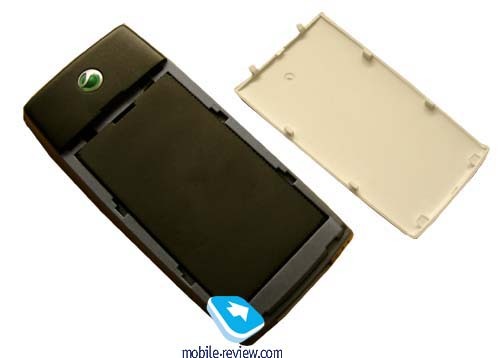 All advantages and shortcomings are similar to SonyEricsson T68/T300. The phone is based on the same platform. For example, as for me, alphanumerical keys resemble keys of T300 in shape and convenience. Functional keys are different now, they become handier, and it is easy to work with them. The same is with joystick, it is rather comfortable as usual. It seemed to me that it was a little bit more convenient than the one in T300, but it is only my opinion. Volume button is placed on the left-hand side. It helps to view time and date and a current profile. Indication of presumed charge level is not available in both phones (Т300/Т310) because of marketing policy, not technological reasons. An IR-port is positioned on the right-hand side and standard system connector is placed on the bottom of the phone. 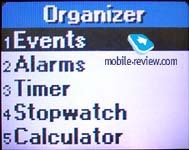 The accessories of current phone line from SonyEricsson are compatible to this model. A strip hole is located on the upper side of the phone. A battery compartment is hidden under a rear cover. 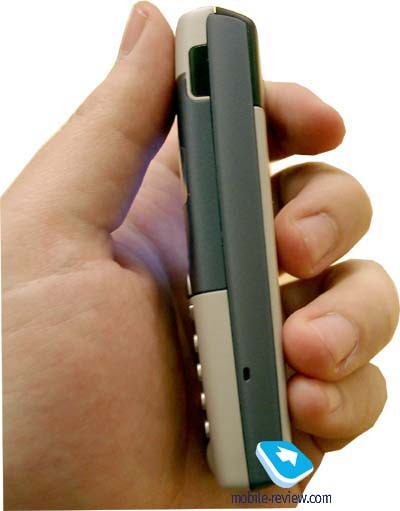 The phone is equipped with lithium-polymer battery of 700 mAh capacity. In contrast to T300, T310 doesn’t have any backlash of rear cover, the battery is fixed and the phone has more reliable construction. We don’t know operating time, which is declared by manufacturers, but think that it is similar to autonomy of T300. So, it is 300-350 hours of stand-by time and 6-7.5 hours of talk time. In reality the phone worked about 5 days in case of 40 minutes of talking (Vodafone network) and up to 1 hour using of different applications (games, alarm-clock and so on). Time of full re-charging is about 2 hours. Menu structure and capabilities are similar to T300 (read a respective review to know about them). Here we’ll describe those changes, which we could find in the phone. Firstly, a set of pictures is renewed in this model. Collection of ringing tones was extended. Apart from traditional melodies, there are several new original ones. Now you can select a melody to your choice or download a new one, which you prefer. T310 has only cosmetic differences, so, it is logical to view changes in the menu “Games”. One of the games is Minigolf, which is the same as in T300. 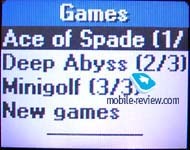 Two other games Ace of Spade and Deep Abyss were also available to users of T300, but as extra games. That is all about differences. In response to connection quality, autonomy and loudspeaker volume, T310 is similar to T300. All changes are only software concerned, they are not considerable. 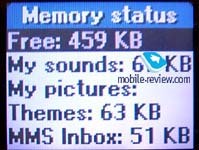 Only pre-installed applications, pictures and melodies are different. Design of T310 is differed from T300, it became more interesting. Loudspeaker hole is harmonized with all other parts of the handset. By the way, ringer volume became louder than in T300. But it is also only my opinion. Strength of vibrating alert is equal in both phones. Official announcement of the models would be before CEBIT, in spring they would go on sale. As T310 is a successor of T310, the first would disappear. We expect that the phone will be available in European shops in April and the price would be about 190 Euro. Price formation would depend on the situation with other models, such as Nokia 3510i and Panasonic GD67. No doubts, that the price of T310 will be higher, than the price of the rival products, as this handset has more advanced features. In response to design, SonyEricsson has more modern phone than competitors. By, the way, T300 won’t be produced after launching of T310.